Westmoreland Cleanways and Recycling would like to encourage everyone to continue the spirit of giving by recycling your live Christmas tree. After the festivities are finished, you can take your tree to one of many drop off sites located throughout Westmoreland County **. The trees will either be chipped into mulch by the municipalities and used to beautify community parks, or placed in natural areas to provide wildlife habitat. **Please note: There have been a few changes compared to previous years. The site for Level Green has changed from the ball-field to the Level Green Volunteer Fire Department. All Locations require that trees are completely bare of decorations when dropped off. This includes any tree bags or wrappings used to transport the tree to the drop-off site. 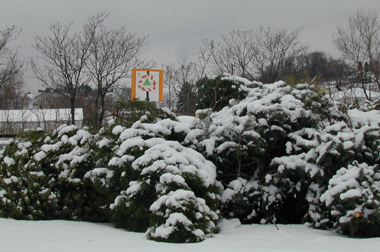 Sponsors of the 2018-2019 Christmas tree recycling program include: Westmoreland Cleanways and Recycling, James A. Rutter Company in Murrysville, Penn Township, and the Borough of Youngwood. Christmas Tree-Cycling is beneficial to the environment. Recycling your Christmas tree returns it to nature, completing the recycling loop. Once the tree is chipped, the chips can be used for mulch or as a surface for hiking trails. The chips then decompose into valuable humus, nourishing and renewing the soil. 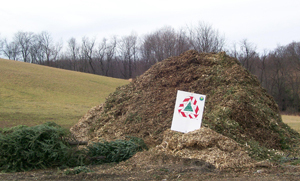 It is estimated that 1 live tree Christmas tree makes 5 pounds of mulch. If not used for mulch, many communities depend on recycled Christmas trees to provide wildlife habitats that prevent beachfront erosion, improve shoreline stabilization on rivers and lakes, and improve fish habitat. If not recycled, live trees thrown away with the garbage in most cases end up taking up space in a landfill. There is an on going debate as to whether it is more eco-friendly to purchase a live tree or an artificial one. Real trees are a renewable and recyclable resource. According to the National Christmas Tree Growers Association, in 2012 there were approximately 13,000 farms, devoting over 309,000 acres of land to growing Christmas Trees in the U.S. Trees from these farms support complex eco-systems, and absorb carbon dioxide and other gases while releasing oxygen. Christmas Trees also stabilize soil, protect water supplies and provide refuge for wildlife. 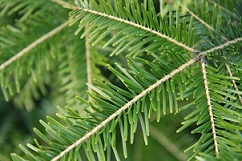 Often, Christmas Trees are grown on soil that doesn’t support other crops. Live trees continue to be beneficial after the holiday season. When recycled, the trees can be used for mulch or wildlife habitat. In contrast, 85% of artificial trees are factory-made in China, using methods that consume natural resources. Typically, the type of plastic that artificial trees are made from is PVC. PVC production can emit dangerous dioxins in the air and water. Furthermore, PVC can be a potential source of lead, which can be harmful to children and pets. This plastic used in manufactured trees is also a petroleum by-product. They are non-biodegradable and not recyclable or renewable. Most will eventually end up in landfills, where they will remain for centuries. For more information about Live Christmas Trees, visit the National Christmas Tree Association website. Tree-cycling is truly giving a gift back to the community. This holiday season, when the festivities have ended, extend the spirit of giving by recycling your live Christmas tree.